Tonight (17 February) may see Europe’s Champions League return for its knock-out phase, but in South America (and Mexico), attention will be very much on the inauguration of the Group Stage of the 2015 Copa Libertadores, the premier club competition. Interest will be particularly high in Venezuela, the nation whose clubs have historically made the least impact in this tournament. 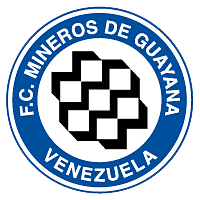 For the first ever time since the round of play-off qualifiers was introduced in 2005, the continent’s traditional underdogs will be represented by their full quota of three teams, as Zamora (2013-14 champions) and Mineros de Guayana (2013-14 runners-up & Apertura winners) will be joined by Deportivo Táchira (3rd in 2013-14 aggregate table, behind the other two qualifiers). Highlights of Cerro Porteño 2-2 Deportivo Táchira (3-4 aggregate), 11 February 2015, Copa Libertadores First Round. Before the first leg was contested on 4 February, the six-time semi-finalists from Paraguay were considered comfortable favourites to progress. Táchira, however, gave short shrift to the supposed script as it took no more than 12 minutes for 34-year-old Argentine Javier López – a recent recruit from Zamora FC – to head in the fine set-piece delivery of 32-year-old erstwhile Venezuela international César ‘Maestrico’ González. Rather than sitting back, San Cristóbal’s finest absorbed and were further invigorated by the raucous atmosphere of a well-populated Pueblo Nuevo and seven minutes later, the fans were to witness a goal that undoubtedly lived up to the significance of the occasion. Maintaining the theme of experience, this came from the much-travelled 37-year-old Jorge Rojas, a recent acquisition from one of the capital’s smaller sides, Metropolitanos, as well as being La Vinotinto‘s third highest-capped player of all-time. Upon receiving a throw-in, Rojas demonstrated why he is known as ‘El Zurdo’, as he let the ball roll into his stride and unleashed an unstoppable left-footed strike from over 30 yards that fizzed in the air before going in off the underside of the crossbar. A goal surely fit to grace any stadium in the world and a fine example of the strength in depth that exists in this competition. Not to be outdone, five minutes after the restart Cerro were to get what proved to be their consolation and seemingly vital away goal, with a strike that left many impartial observers unsure as to which was the finest of the game. This was a swerving 30-yard free-kick from Jonathan Fabbro, an Argentina-born Paraguay international who has represented clubs in six countries within Latin America and who, at 33 years of age, was well on-message with this game’s theme. Thus, with an away goal to their name and home advantage for the decisive tie on 11 February to look forward to, Cerro returned to the Paraguayan capital confident that a group berth awaited. When, with 40 minutes on the clock, Fabbro again got on the scoresheet – this time via a dubiously awarded penalty – many home nerves dissipated as now Táchira were compelled to attack in order to avoid elimination, thus leaving them vulnerable on the counter. Yet, while at times the Venezuelans rode their luck, from the very first minute they always looked like they were capable of posing a threat, not to mention a surprise or two, the first of which they delivered on 55 minutes. Gelmin Rivas, the club’s leading goalscorer with 11 goals in 17 league games, followed up the good work of Pablo Olivera – recently acquired from Uruguay’s second tier – to hold off defenders and adeptly side-foot home. The onus was thus back on the hosts and to their credit, they required little more than five minutes to regain the lead with that man Fabbro again involved in the goal, albeit this time as supplier. He did well on the right of the area to shrug off some challenges before chipping a fine cross into the area that local youngster Cecilio Domínguez chested and dispatched with a consummate ease that belied his 20 years. However, as the Asunción crowd began pondering whether or not extra-time would be necessary, Rivas abruptly rendered any such musings academic, stunning the home faithful within a minute of the restart. The striker, who was linked with a possible move to Standard Liège or Club Brugge in January, picked up the ball 30 yards out and evaded a challenge to hit a low bouncing shot from the right edge of the area into the bottom far corner. 2-2, the local scoreboard now alarmingly read. Although the goalkeeper Rodolfo Rodríguez probably should have parried this shot away, any anger felt by the home fans had to be suppressed as this sensationally swift turn of events meant that their side now had to frantically get their act together and score twice in just under half an hour. As it panned out, while Cerro did have the bulk of the remaining chances, Táchira were to resist and hold on, thus not only qualifying for the group stage but also managing to avoid defeat against a side that had reached this very phase in four of the past five years. Although it is unlikely that fans of Táchira’s El Clásico foes Caracas FC share the following sentiments, it must be said that as this second leg victory was immediately followed by the national team’s second successive win over Honduras in a week, for many Venezuelan football fans this was certainly a day to be savoured. With the confidence gained from their impressive win against Cerro Porteño coupled with their return to form in the early stages of Venezuela’s Torneo Clausura, Los Aurinegros should feel that advancing from Group 8 (of 8) is not beyond their capabilities. Indeed, while the encounter with Argentine champions Racing and their strike-force of Diego Milito and Gustavo Bou may cause the most butterflies, their games against Peruvian champions Sporting Cristal and another Paraguayan side, Guaraní, now seem, by comparison, manageable. Coach Daniel Farías will certainly be hoping his side does not experience a similarly disastrous decline in form that befell them in the 18-team Torneo Apertura when they contrived to fall from 1st at the midway point to a final position of 11th. To avert this, the form of various key players will be crucial: goalkeeper Alan Liebeskind, who has made a strong impression since joining at the beginning of the Clausura; young centre-back Wilker Ángel, who can chip in with more than his fair share of goals from set-pieces and who may well be heading abroad later in the year; playmaker César González, whose set-pieces and link-up play will be vital, as will be those of Jorge Rojas, though how much of the campaign the latter will feature in at his age remains to be seen; another dead-ball specialist, albeit one surely not concerned with stamina issues is young, creative livewire Yohandry Orozco, a man who will want to use this opportunity to display to a wide audience some of the talent that gained him recognition four years ago; the service of the likes of Orozco, Rojas, González and, to an extent, Pablo Olivera, will need to be spot-on in order for striker Gelmin Rivas to have a prosperous tournament, being as he is in the main a penalty-area predator. 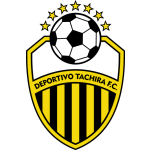 Before Táchira get their campaign underway with a home game against Racing, the 2013-14 champions of Venezuela will be ushering in their nation’s participation in the tournament with an away game against Montevideo Wanderers. Their Uruguayan opponents will be hosting this encounter at Parque Central, the home of their more illustrious cross-city neighbours, Nacional, whose qualifying-round conquerors Palestino – a Chilean side originally set up by Palestinian immigrants – are the third side in Group 5. The final team is Argentine giants Boca Juniors who, having raised eyes and expectations with the recruitment of Uruguayan international Nicolás Lodeiro, Málaga midfielder Pablo Pérez and striker Dani Osvaldo, promise to be the dominant threat. Zamora may have won last season’s championship but, as is often the case in South America, they were victims of their own success. Consequently, key individuals were swiftly snapped up by all and sundry, such as midfielder Pedro Ramírez (FC Sion), leading goalscorer Juan Falcón (FC Metz) and, most significantly, manager Noel Sanvicente (Venezuela national team). They thus began the Torneo Apertura campaign in August disastrously, not picking up a win in their first 11 games and finding themselves rooted to the bottom. However, their form was to undergo a remarkable U-turn as their final six games ended with five wins and a draw, salvaging some pride with a final position of 12th. This reversal in fortunes has impressively and, with the reputation of Venezuelan football on the continental stage in mind, thankfully, continued into the second half of the domestic season, as they currently sit 1st in the Torneo Clausura, with four wins and two draws – unbeaten in a total of 13 games. Key to continuining this impressive transformation under coach Julio Quintero will be the performance of the defence, which has four clean sheets in the past six games and now features some new faces as well as the likes of Panama international Luis Ovalle and the long-serving Moisés Galezo. Other players whose roles will be crucial include deep-lying playmaker, set-piece taker and occasional shield Luis Vargas, as well as fellow midfield stalwart Arles Flores; with his dribbles down the flanks as well as the inroads he makes infield, temperamental-yet-gifted 19-year-old Jhon Murillo – who had an unsuccessful trial with Basel last year – will certainly be hoping to make an impression, as well as chip in with some goals; the man who has been on target the most for the champions and who was the catalyst behind their return to form is attacking midfielder/support-striker Pierre Pluchino, whose elegant creativity and finishing will be crucial; lastly, Santiago Bello, a striker with an impressive record recently brought in from the Uruguayan second tier in advance of the Libertadores – so far yet to start a game, but from whom goals are anticipated. 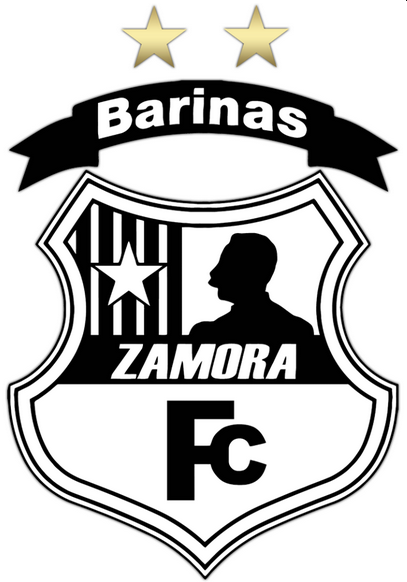 The 2013 Torneo Apertura winners and overall runners-up for 2013-14 have thus far had a rather mediocre season, sacking Richard Páez (the well-respected former national team manager from 2001-07) and ending the most recent Apertura in 6th place. Their uninspiring form has continued into the Clausura as they sit in 11th place, having played six games – one, and in some cases, two, more than the vast of majority of the sides around them. 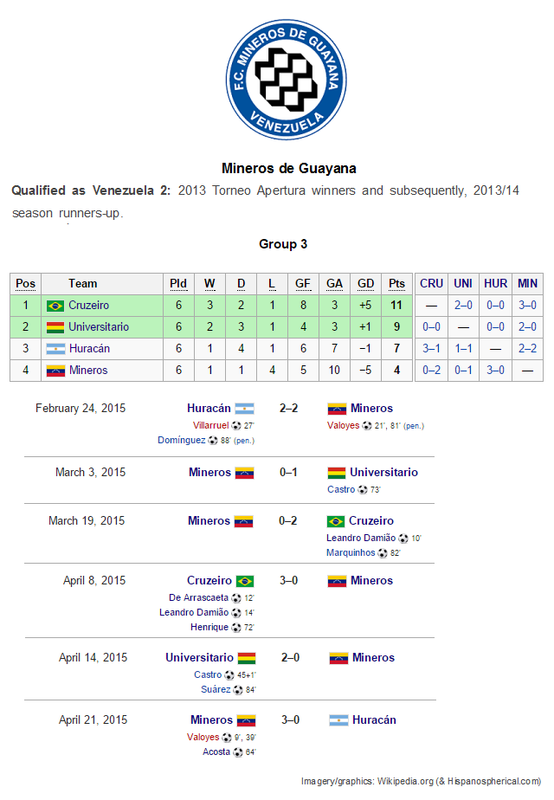 Thus, of Venezuela’s three representatives, Mineros are currently heading into this tournament with the worst form. However, they may be able to boost morale ahead of their official entrance into the competition as they will be involved in another league game before they play their opening Libertadores match next week on Tuesday 24 February away to Argentine side Huracán (Update 24/2/15: this game against Estudiantes de Mérida did not take place due to the tragic death of club captain Carlos de Castro. Mineros now find themselves 12th in the table). This newly promoted club – who qualified by virtue of winning the Copa Argentina – will certainly be no pushover, as evidenced by their comfortable 4-0 play-off round win over Peru’s Alianza Lima. The other two sides that will be contesting Group 3 are champions of their respective countries: Club Universitario of Bolivia and Cruzeiro of Brazil, the latter of whom, despite some post-season departures, will be firm favourites and who now count Leandro Damião and Uruguayan prospect Giorgian De Arrascaeta amongst their ranks. The success or otherwise of Mineros will depend largely on players who have mostly performed at a standard markedly lower than they did last season suddenly raising their game, however unlikely that may seem. Their side consists of many individuals who regularly receive call-ups to the national squad, such as goalkeeper Rafael Romo who, judging by his inaction in the recent Venezuela friendlies, finds himself demoted from second to third choice; Gabriel Cichero who, though certainly not without his critics, is Venezuela’s first-choice left-back and who also possesses attacking qualities, particularly on set-pieces; the two defence-minded midfielders Rafael Acosta and Édgar Jiménez also have their attacking merits, but when playing for the national side have largely been panned, particularly when they were both regularly left for dead in November’s 5-0 thrashing handed out by Chile; striker Richard Blanco recently played and scored a tap-in against Honduras but, as this was a squad of home-based players, he is unlikely to get a regular call-up; depending on form, the Colombian duo of Zamir Valoyes and James Cabezas may well find themselves sidelining Blanco; Cabezas was brought in from recent Apertura winners Trujillanos (where he scored 10 goals in 16 games), along with defender Edixon Cuevas, yet rather than boost the squad, both have thus far struggled to replicate the form they displayed at their old club. As a final consideration, it will be interesting to see how former Venezuela international defender Luis Vallenilla copes against the pace of the likes of Cruzeiro, given that he turns 41 in March. If following the three clubs was not enough for Venezuelan football fans, there are also some other compatriots who will be competing in this year’s edition for Colombian sides. Luis Manuel Seijas, a left-sided attacking midfielder who features regularly for the national side will be playing for 2014 Torneo Finalización champions Independiente Santa Fe. 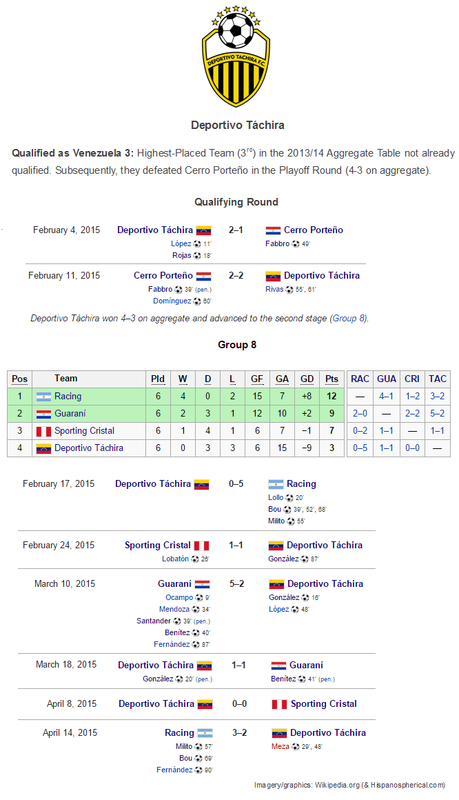 They have been drawn in Group 1 and their very first match comes tonight away to Mexico’s Atlas after the second game of interest – Táchira’s – has finished – a long night is thus in store for all. The two other teams in their group are 2014 Copa do Brasil winners Atlético Mineiro and last year’s Chilean Clausura winners, Colo-Colo. In Group 7, Colombia’s 2014 Apertura winners Atlético Nacional should field another Venezuelan international midfielder, Alejandro Guerra. Also in their ranks is Jonathan Copete, a Colombian in origin but who has been in talks for some time now with Venezuelan national boss Noel Sanvicente about naturalisation and who could well feature in future national team squads at some point this year. Irrespective of how his international aspirations pan out, both men come into this competition with strong continental experience, having been part of their side’s run to the final of December’s Copa Sudamericana, in which they were runners-up to River Plate. Their first Libertadores match will be on Thursday 19 February and will be possibly their sternest test, being as it is against Paraguay’s 2014 Apertura and Clausura winners, Libertad. Their other two opponents are Ecuador’s championship runners-up Barcelona and Argentina’s Estudiantes de la Plata, whose President regular Argentine football fans will know is club legend Juan Sebastián Verón. While this is a far from straightforward group to negotiate, Guerra and Copete will fancy their chances of qualifying for the knock-out stage. 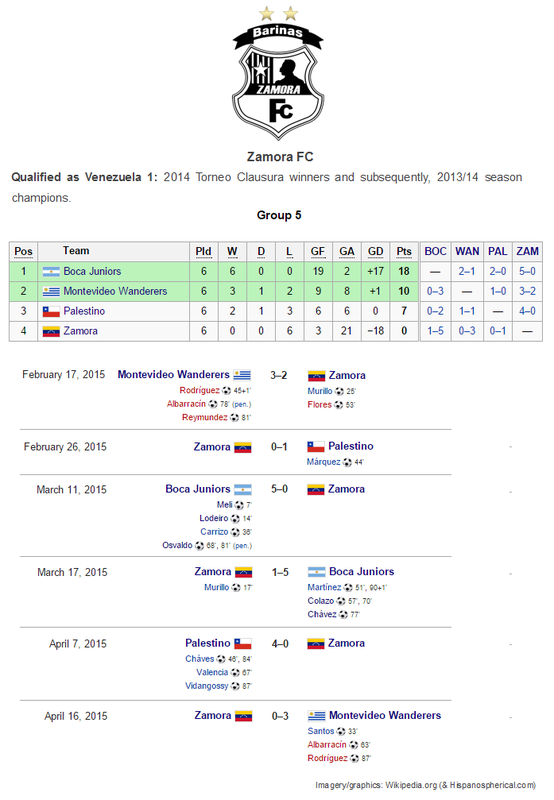 Although the general consensus is that the two Colombian sides featuring Venezuelans have more chance of progressing than the three domestic teams, one can not help but feel that no matter what happens, many memorable moments will occur this year for Venezuelan football fans to recall fondly for some time afterwards. It is going to be an enthralling tournament which should be covered as much as possible from a Venezuelan perspective on this site. Now, that is more than enough talking – let’s get the caffeine ready and prepare for some long nights of top-level action! This entry was posted in Copa Libertadores and tagged Alan Liebeskind, Alejandro Guerra, Alianza Lima, Argentina Racing, Arles Flores, Asunción, Atlas, Atlético Mineiro, Édgar Jiménez, Barcelona, Barcelona (Ecuador), Boca Juniors, César 'Maestrico' González, César González, Cecilio Domínguez, Cerro Porteño, Colo-Colo, CONMEBOL, Copa Bridgestone Libertadores, Copa Libertadores, Copa Libertadores 2015, Copa Libertadores de América, Copa Libertadores English, Copa Libertadores Group Stage, Copa Sudamericana, Cruzeiro, Dani Osvaldo, Daniel Farías, Deportivo Táchira, Diego Milito, Edixon Cuevas, Estudiantes de la Plata, FC Metz, FC Sion, Gabriel Cichero, Gelmin Rivas, Gustavo Bou, Huracán, Independiente Santa Fe, James Cabezas, Javier López, Jhon Murillo, Jonathan Copete, Jonathan Fabbro, Jorge Rojas, Juan Falcón, Juan Sebastian Veron, Libertad, Luis Manuel Seijas, Luis Ovalle, Luis Vallenilla, Luis Vargas, Málaga, Mineros de Guayana, Moisés Galezo, Montevideo Wanderers, Nacional, Nicolás Lodeiro, Noel Sanvicente, Not the Champions League, Pablo Pérez, Palestino, Palestino Chile, Parque Central, Pedro Ramírez, Pierre Pluchino, Racing Club, Rafael Acosta, Rafael Romo, Richard Blanco, Richard Páez, River Plate, Santa Fe, Santiago Bello, South American football, Sporting Cristal, Universitario, Venezuela, Wilker Ángel, Yohandry Orozco, Zamir Valoyes, Zamora FC on February 17, 2015 by hispanospherical.